Startup Lessons From Craft Beer: Where Do You Start? Startup Lessons From Craft Beer: Where The %&*# Do You Start?! 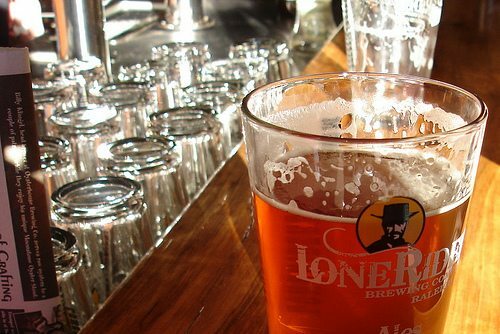 We spoke with Sumit Vohra, CEO and Chief Drinking Officer at Lonerider Beer, one of the of many small craft breweries who call Raleigh, North Carolina home. Over the course of almost ten years he’s seen his passion for beer grow out of garage project he worked on with close friends, and into a well-respected business. In 2008 he quit his comfortable corporate job and poured his savings into his passion project, a brewery called Lonerider. It’s a story we’ve all heard before especially in the current start up boom period. However, Lonerider’s story isn’t one based on astronomical valuations, questionable business models and shady accounting. It’s one rooted in principled decision making and laser sharp focus stemming from years of real life wisdom and corporate management experience. It’s through this hard-nosed approach that Lonerider was able to scale from producing just 700 barrels in 2009 to over 11,100 barrels in 2012. LoneRider is by no means large, it produces just three styles of beer with one seasonal brew and one special 22 ounce beer per quarter. Yet is widely respected amongst local craft brewers. Sumit sat on the board of the North Carolina Beer Brewers Guild for over two years. The focused determination has lead Lonerider’s hefeweizen, aka ‘Shotgun Betty’, to be considered by industry insiders as among the best in the craft beer business. That’s not to say Lonerider lives under the tyranny of caution, they’re still a creative and fun loving brewery. They simply limit the short-term excitement, as well as the creativity and productivity sapping planning stages involved in developing new styles of beer to just a handful of seasonal and specialty brews. This allows the Lonerider team to focus on the long term goal of consistently brewing the best beers possible. Not getting sidetracked by the short term gains and hype often associated with really cutting edge beer is the smartest way to make that happen. So is less really more? The craft beer fans at BeerAdvocate think so, they rated Lonerider’s ‘Cowboy in Black’ one of the must try beers of 2013.